Click HERE to download a two page PDF for instructions on how to order OECD certified C-1 FINOLA planting seed for 2017. These instructions include a link to our ordering form. Click HERE for a new 469 Kb PDF on practical farming information. Click HERE to download a new 2.5 Mb PDF on FINOLA’s morphology and development. Most FINOLA growers have good results, some not. Click HERE for a short list of the 10 most common reasons for failure with this oilseed crop. Please have a look at this document and avoid these common problems! Click HERE to download a new 100 Kb PDF that describes some basic things about us, the FINOLA variety of oilseed hemp, the Finola Ltd. company and the Finola® registered trademark. During the December 2016 holiday season, the United Kingdom’s Department of Farming and Rural Affairs (DEFRA) submitted Implementing Decision (EU) 2016/17 to the European Commission. This was DEFRA’s second attempt in 10 years to ban the cultivation of FINOLA in the UK. We did not agree with this recent decision, just as we did not agree with DEFRA’s first attempt to ban FINOLA after 2006. This recent witch hunt relied on THC results from only two field samples; one in 2014 and one in 2015. Both were collected from the same farm in Northern Ireland. Both samples were collected late, and not according to EU regulations. Both samples happened to be just slightly over the 0.2% THC limit, because of the late sampling. Instead of wasting another seven years with polite e-mails, we quickly decided to launch a judicial review against DEFRA this time, after they initially refused to discuss the matter with us directly. After just a few weeks, DEFRA realized and acknowledged some of their mistakes, then took administrative steps to cancel the prohibition they had just asked the European Commission to implement. DEFRA has promised to take additional steps to correct the damage they have caused so far, and we’re still waiting for them to delivery on that. On 11 October of 2016, the European Commission passed this NEW Implementing Decision to cancel the prohibition that DEFRA had just asked them to pass in December of 2015. If hemp samples are still collected in your country for THC testing, please be sure to help your agricultural officials plan for the correct time to take field samples of FINOLA (between 40 to 60 days after sowing in the UK and Central Europe). The correct time of sampling is dependent on latitude and heat energy, with earlier sampling at warmer lower latitudes (40-50 days after a sowing near latitude 50o) and later sampling at higher latitudes (50-60 days after sowing near latitude 60o). Click HERE for bulk hempseed oil sales (over 1000 L). 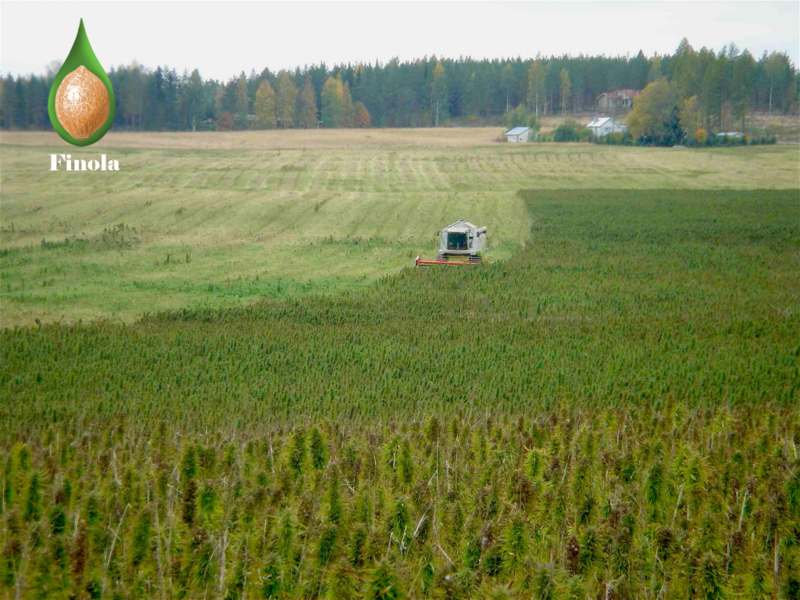 The FINOLA oilseed hemp variety is an excellent source of sustainable food and fiber. The exceptional fatty acid profile in Finola® hempseed oil offers a rich source of the essential fatty acids (EFAs); omega-3 ALA and omega-6 LA, in addition to significant amounts of GLA and SDA. We can’t make the EFAs ourselves, so we have to get them from the daily diet. The EFAs are needed to produce many important things in our bodies, including optimal nerve functions throughout the brain and central nervous system. Finola® hempseed oil is a safe and nutritious way to consume our dietary EFAs, to better our somatic health already at the neuronal level.